A tough procurement with just 145 examples graded, this 1959 Lincoln offers deep mirrors and snow-white devices rare among 1959 Proofs. Both the obverse and reverse display spot-free, haze-free, and flawless-to-the-naked eye mirrors, as well as, perfect depth and rich, red-black color. 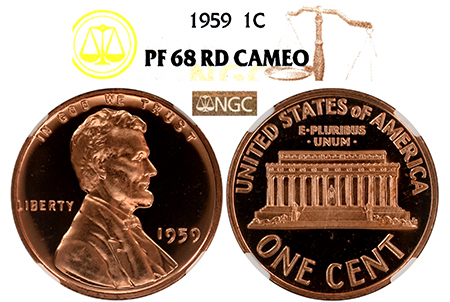 Fully frosted, heavy Cameo devices create that rare black-and-white contrast that doesn’t come easy for Lincolns!